Here it is, the first podcast from The Four Men Just, four TV and film fans with too much time on their hands who decided one Sunday over Twitter to record a podcast that same night. The idea was to celebrate the work of someone, perhaps an actor, actress, writer or musician, whose work deserved revisiting over the course of an hour. 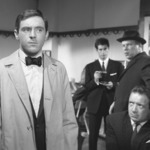 As such a rushed beginning might suggest, the result is an unscripted ramble discussing the life and legacy of actor, singer and songwriter, Mr Anthony Newley, mainly focusing on his 1960 TV series, The Strange World of Gurney Slade. We also touch on some of his films: The Small World of Sammy Lee (1963) and Can Heironymus Merkin Ever Forget Mercy Humppe and Find True Happiness? (1969).